Liftoff with the SES-owned O3b FM13 through FM16 satellites is targeting an instantaneous window at 16:37:06 UTC to kick off a mission of two hours and 23 minutes aiming to deliver the four satellites into a 7,830-Kilometer orbit directly over the equator. Friday’s launch will bring the total number of O3b satellites in orbit to sixteen, following quadruplet launches atop Soyuz ST-B rockets in 2013 and 2014 that established the initial constellation to deliver continuous services to customers at latitudes lower than 45 degrees. O3b Networks was founded back in 2007 to start an effort of connecting “the Other 3 Billion” – referring to the population of the world without readily available access to broadband data services. 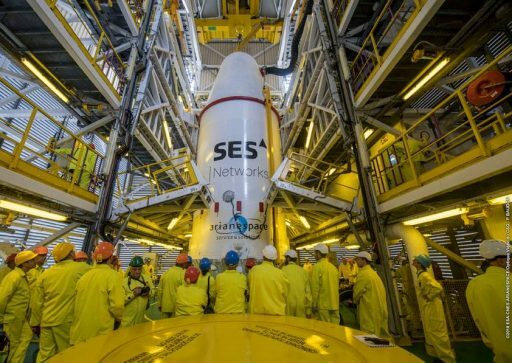 Backed by industry giants Google and SES over the first years of operation, O3b proved its business model by attracting a number of customers for the initial constellation including U.S. Department of Defence contracts. In 2016, O3b Networks was acquired as a wholly-owned subsidiary of Luxembourg-based SES, one of the world’s largest telecommunications providers. SES plans to continue operating and expanding the current constellation of O3b satellites in equatorial orbits before upgrading to a much more powerful system called O3b mPower that will deliver nearly 30,000 spot beams in its initial configuration and allow for smart routing of traffic between the constellation in Medium Earth Orbit and SES satellites parked in the Geostationary Belt. 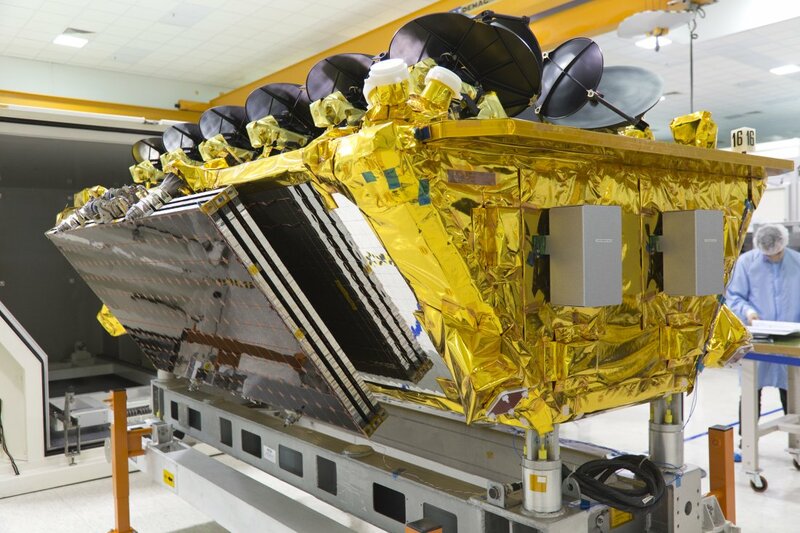 The four O3b satellites launching on Friday were ordered from Thales Alenia Space in 2015 as part of an eight-satellite expansion order for the first generation constellation. 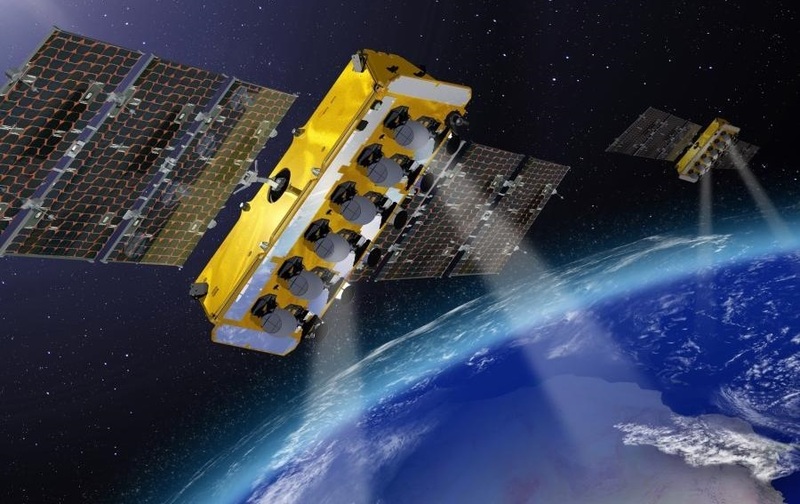 These eight satellites have some performance enhancements over the first dozen launched in 2013 and 2014 and will help extend O3b services into the second half of the 2020s. Based on the ELiTeBus satellite platform, each O3b satellite weighs in at 700 Kilograms and hosts twelve fully steerable Ka-Band antenna assemblies operating at the 4.3 GHz frequency. Ten are used to connect to remote terminals while the remaining two provide the gateway links needed to connect the remote customers to the Internet. 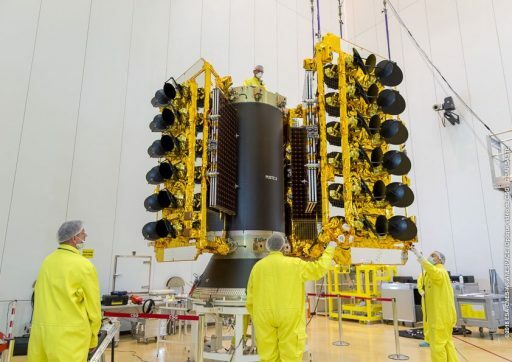 Each satellite can deliver a throughput in excess of 12.5 Gbit/s with an end-to-end latency better than 240 milliseconds since the satellites only orbit at around 25% the distance of their counterparts in Geostationary Orbit. On the January 25 mission, Ariane 5 flew 20 degrees off its planned course because a programming error of the rocket’s Inertial Measurement System was not detected during pre-launch verifications, taking the launcher much closer to the nearby town of Kourou than it would normally come and delivering its two satellites into a less-than-optimal orbit. 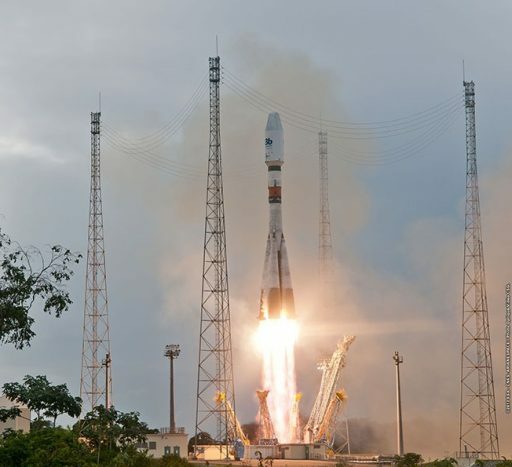 An Independent Enquiry Commission chaired by the European Space Agency studied the root cause of the anomaly and green-lighted an action plan developed by ArianeGroup and Arianespace to implement enhanced end-to-end verification of mission specific parameters prior to launch. ESA declined to publish the independent commission’s report or answer questions related to it. Soyuz VS18 was pushed from a planned Tuesday liftoff to Friday, providing three days for what Arianespace called “additional checks as part of the resumption of launches from the Spaceport in French Guiana.” The Soyuz ST-B rocket for this mission was moved from the MIK launcher integration facility to the ELS launch pad on March 2nd followed by the rollout of the upper composite comprising the encapsulated satellites and Fregat upper stage on March 6. Towering 46-meters above its ELS launch pad, still protected inside the Mobile Service Gantry, Soyuz will enter an eight-hour countdown sequence on Friday. 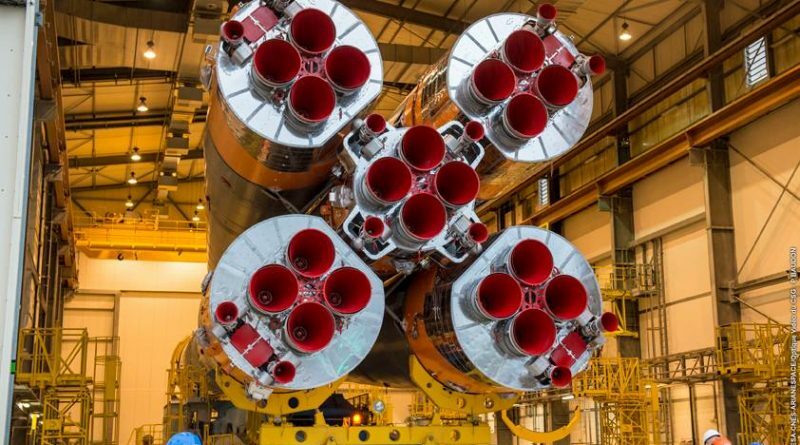 Initially going through a series of pre-launch checks, Soyuz will be cleared by the Russian State Commission around five hours ahead of the day’s T-0 time with propellant loading operations starting at the L-4 hour mark to load the four boosters, core stage and third stage with 274 metric tons of Liquid Oxygen and Kerosene. 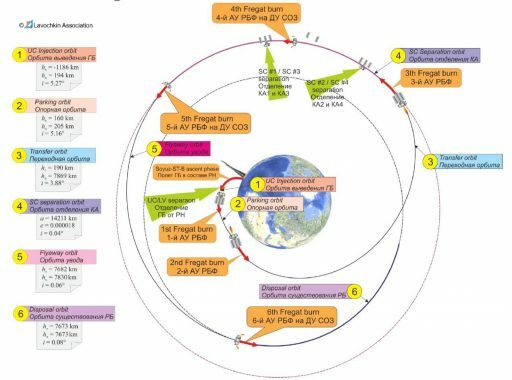 In addition, the Soyuz receives Nitrogen and Helium to act as tank pressurization gas while the boosters & core also receive highly reactive Hydrogen Peroxide to drive the engine turbopumps. Standing fully-fueled, Soyuz will be revealed atop is launch pad with one hour to go in the countdown when the Service Gantry will be moved to its launch position. The four satellites will move to internal power around 20 minutes before launch and a final check at L-10 minutes will give clearance for the six-minute Automated Countdown Sequence. 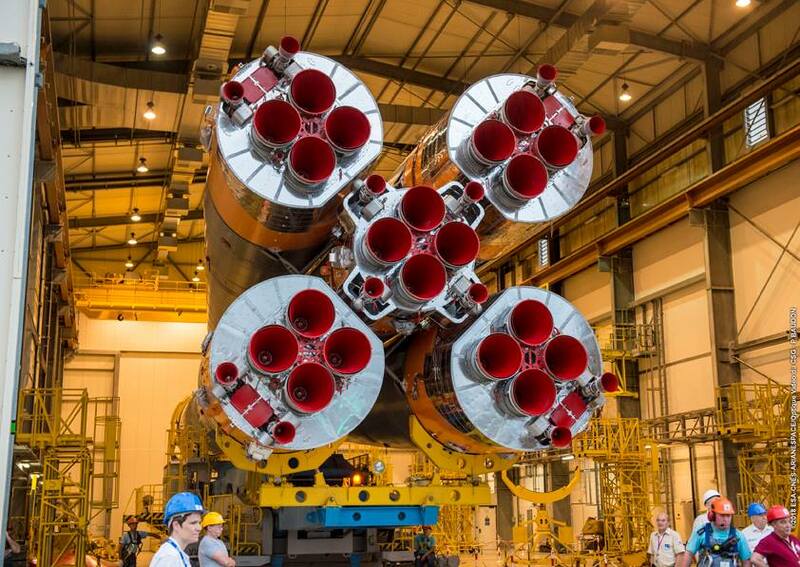 Checking off its final countdown steps, Soyuz will power up its telemetry systems, purge its engines with inert nitrogen, pressurize its tanks and switch to onboard power & control. At T-20 seconds, the Launch Command is issued and all engines of the boosters and the core stage are ignited to first soar to an intermediate thrust level before ramping up to full thrust. Liftoff is timed for precisely 16:37:06 UTC, 1:37 p.m. local time in French Guiana to allow the O3b satellites to reach their precisely planned injection point within the existing constellation. Rising from its pad, Soyuz will complete a brief vertical climb before pitching and rolling onto a due-easterly departure path on an equator-hugging trajectory that will ultimate lead it into an equatorial orbit. Burning 1,600 Kilograms of propellant per second, Soyuz will quickly pass the speed of sound and encounter Maximum Dynamic Pressure as it makes its way out of the atmosphere. The four boosters will shut down their RD-107A engines at T+118 seconds after each burned nearly 40 metric tons of propellant to help Soyuz accelerate to a speed close to two Kilometers per second. Swinging outward, the 19.6-meter long boosters will drop away from the core stage that will continue firing its RD-108A engines at full throttle, pushing Soyuz into space with a thrust of 102 metric ton-force. Three minutes and 55 seconds into the mission, Soyuz will split open and separate its fairing halves, revealing the four O3b satellites around their cylindrical payload adapter. After burning over 90 metric tons of propellant, RD-108A will shut down four minutes and 45 seconds into the mission followed two seconds later by the ignition of the Block I upper stage and the pyrotechnic separation of the 27.8-meter core. Soaring to a thrust of 30 metric ton-force, the RD-0124 engine will be in action for four and a half minutes, in the process burning 25,400 Kilograms of Oxygen and Kerosene. Separation of the Fregat is planned nine minutes and 23 seconds into the mission onto a sub-orbital arc from where the upper stage will make three burns to initially reach a stable orbit, then maneuver into an elliptical transfer orbit and eventually circularize the orbit directly above the equator – creating a mission of over two hours. Fregat, loaded with 7,100 Kilograms of self-igniting propellants, will fire up its 2,000-Kilogram-force main engine one minute after separating from the Soyuz on a burn of exactly four minutes, aiming for a Low Earth Parking Orbit of 160 by 205 Kilometers, inclined 5.16 degrees. This will be followed by a brief passive coast phase of only eight and a half minutes to allow Fregat to complete the second & longest burn of the mission while crossing the equator so that the high point of the resulting orbit is placed over the equator on the opposite side of the planet. The second burn is programmed to start at T+22 minutes and 50 seconds and runs for seven minutes and 36 seconds to inject the stack into a transfer orbit of 190 by 7,869 Kilometers at a slightly reduced inclination of 3.88 degrees. Next will be the mission’s longest coast phase as Fregat has to climb all the way to the apogee of the transfer orbit for the circularization maneuver, taking the vehicle halfway around the globe. Re-start of the S5.92 main engine is planned one hour, 52 minutes and 45 seconds into the mission and the burn will last for five minutes and six seconds – accomplishing the circularization of the orbit at 7,830 Kilometers and a reduction of inclination to 0.04 degrees. This will set the stage for the separation of the first two O3b satellites at T+2 hours and one minute, using loaded springs to push the satellites off into opposite directions. 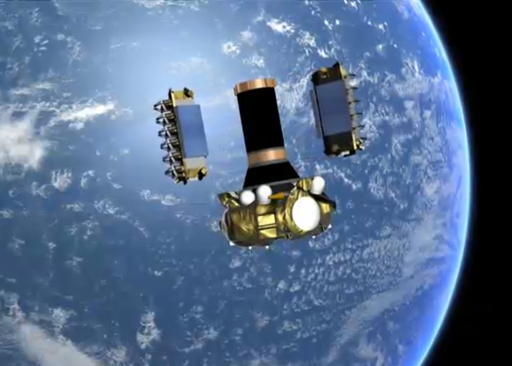 The separation of the second pair of satellites will be preceded by a 17-second re-start of the Fregat upper stage two hours and 16 minutes after launch so that they will be placed into a slightly different orbit to ease the process of drifting them into the proper slots within the constellation. Separation of the second pair at T+2 hours and 23 minutes will mark the end of the VS18 primary mission, the first of up to four Soyuz missions from the CSG in 2018.